Senior Colton Kooima poured in a season-high 40 points in leading No.5 Northwestern Men’s Basketball to a 108-92 win over Presentation Tuesday night at the Bultman Center. The win was the 400th for head coach Kris Korver, who currently is ninth on the NAIA’s active win list. Korver is the top coach with the most wins in program history with a 400-152 record in his 18 years at NW for a 72 win percentage. Kooima made 14 out of 24 field goal attempts and made five three-pointers for his third 40+-point game of his career. Senior Nathan Wedel contributed 25 points and six rebounds, going 10-for-13 from the field, and senior Riley Francis also in double figures with 13. NW began the game with a 9-2 run and led 12-6 after the first four minutes, scoring all 12 points from beyond the arc by Kooima and Wedel. 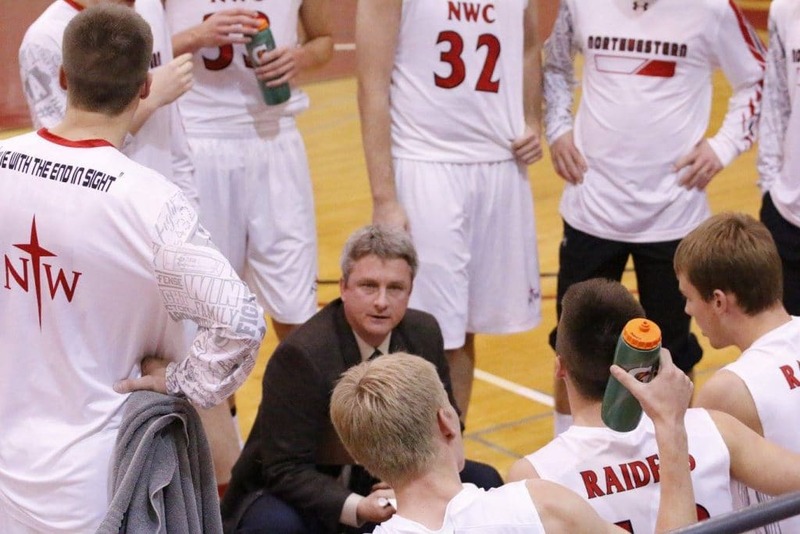 Down by one moments later (20-19), a three-pointer by senior Derek Buysse put NW up for good and another Buysse three-pointer gave the Red Raiders an eight point advantage, 34-36, at the eight minute mark. NW held a double-digit lead for the duration of the final half with Presentation getting no closer than 10 (96-86), with four minutes left. On the night, NW shot 56 percent for the game, 42 percent (11/26) from beyond the arc. The Red Raiders had a 41-36 advantage on the boards, led by Wedel with six. NW has had the advantage on the glass in four straight games. Kooima and Wedel have scored in double figures in every game this season; Kooima has three 40+ point games for his career; Wedel has two 20+-point games this season, 18 for his career. NW improves to 5-0 and continue to prove why there are the fifth best team in the nation. The Raiders face Doane College for their GPAC opener Saturday afternoon. They will continue GPAC play when they travel to Hastings, Neb., to take on the Broncos next Tuesday, Nov. 21.